KGW News Channel 8 Comes to Play! 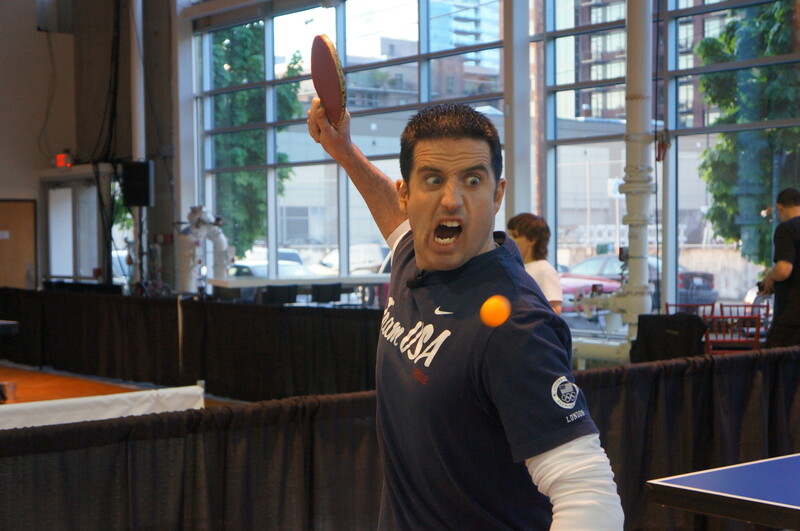 For those that missed out on the fun, EARLY morning action back in April, Drew Carney from the morning KGW News Channel 8 came to see what Pure Pong is all about after first opening. Over 20 Ping Pong players moseyed in at 4:30 a.m. to play, show their support, and be part of the filming–strong evidence of the incredible passion the Portland Ping Pong community has for both the sport, and Pure Pong, though maybe it was the Voodoo donuts and free coffee we gave away… you be the judge. Regardless, we again so appreciate everyone that has, and continues to come play at Pure Pong. We also thank Drew for coming in, we had a blast, and if you see this post, we have your Pure Pong t-shirt waiting! See footage of Drew playing doubles with Pure Pong Olympian, Sean O’Neil, against owner, Duane Smith, and State Champ, Tim Aikey. Become a Certified ITTF Coach this Summer!